Sunday was one of those days where I felt like cooking, had the time to do it, wanted to try something new, but wasn't in the mood for anything. Nothing sounded appealing. Jon and I couldn't agree on what we wanted either - he didn't feel like chicken, I wanted pork but he didn't, he wanted beef but I didn't, and I don't like fish. I finally convinced him to go with a stuffed pork tenderloin recipe I found, but when I got to the store all of the pork was packaged in 10 pound loins and I didn't feel like dealing with it. So Jon got his wish for beef when I spotted a nice flank steak in the case. 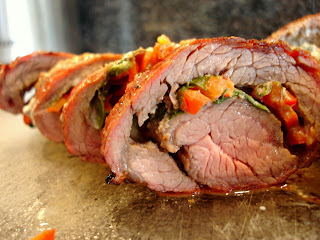 We have done a few different things with flank steak - grilling, various marinades, even a bracciole. I got my inspiration for tonight's meal from the bracciole I made last year and by looking at the ingredients I had in the fridge. Before cooking - trim and pound the steak thin (or butterfly it as well - works great for a roulade), and marinate it to tenderize the meat. I marinated it for a few hours in a simple marinade of Worcestershire, lime juice, and olive oil. Lay flank steak on a piece of plastic wrap in front of you so the grain is running side to side (when you roll the steak and then slice to serve, you want to be cutting against the grain). Put a layer of cheese across the center of the steak; top with evenly spread red peppers and spinach. Begin rolling the steak; having the plastic wrap under the steak helps you hold onto the steak and tuck it tightly while rolling. We chose to grill the steak; it took about 35 minutes on a hot grill. You could also sear the steak and finish it in the oven. Some of the cheese came out of the steak while cooking, but the flavor was still there. It looked beautiful when sliced. We also had a small piece of steak that we simply grilled after marinating. As simple as the marinade was, we were very surprised at the amount of flavor it gave the steak. In case you haven't noticed yet, we eat plain rice with a lot of our meals. Most guys are meat and potatoes guys...my husband is a meat and rice guy. He loves white rice! I changed it up on him a bit tonight with inspiration found in this recipe. I made a few changes; my version is below. While rice is cooling, heat olive oil in a pan. Add veggies and saute until tender, about 6-7 minutes. Let cool slightly. Combine rice with veggies, parsley, and cheese. Mix in eggs and bread crumbs. Season with salt, pepper, and thyme. Form rice into patties; I got 8 patties from these ingredients. Set formed patties on wax paper. I then put them in the fridge until I was ready to cook them. Heat olive or vegetable oil in a large pan; you'll need the oil to be about an inch deep. Gently drop the patties into the hot oil and let cook for about 4 minutes on each side, or until golden brown. Transfer with a slotted spoon to a plate covered with paper towels. On their own, these cakes were just ok, but I'd like to try some other things with them..
- I'd love to experiment with different flavors to complement different main dishes, such as cumin and chili powder mixed with rice, mild and hot peppers, and corn for a Mexican inspired taste. They'd be great served with a cilantro cream. Italian spices with rice, celery, peppers, and served with marinara sauce would be great with an Italian inspired chicken or steak dish. The possibilities are endless, and these are a simple side so it's easy enough to experiment. - I thought the cakes were a bit dry, even with my addition of cheese. When I had my leftovers, I whipped up a quick sauce. I heated a 1/4 cup of half and half in a pan, added red pepper flakes, a tablespoon of alouette, and a tablespoon of shredded Parmesan. This was a nice thick and creamy sauce and was perfect over the cakes - anything thinner wouldn't have held up to the cakes. Clean and trim Brussels sprouts and put in a large pot with about 1 inch of water. Make sure the sprouts are in a single layer on the bottom of the pan. Bring to a steady simmer and cook for 8 minutes or until slightly tender but not mushy. Drain and set aside. Add 2-3 cloves chopped garlic; saute 2 min. 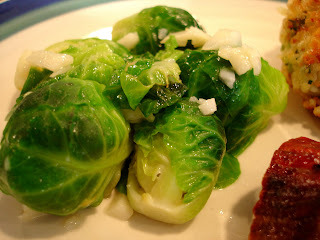 Add sprouts and toss until fully coated with the butter and garlic. Oh my gosh. All of this looks delicious! I will definitely have to try these out. This looks like a fabulous Sunday meal. 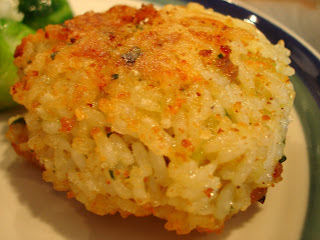 I love your roulade and pairing it with rice cakes!